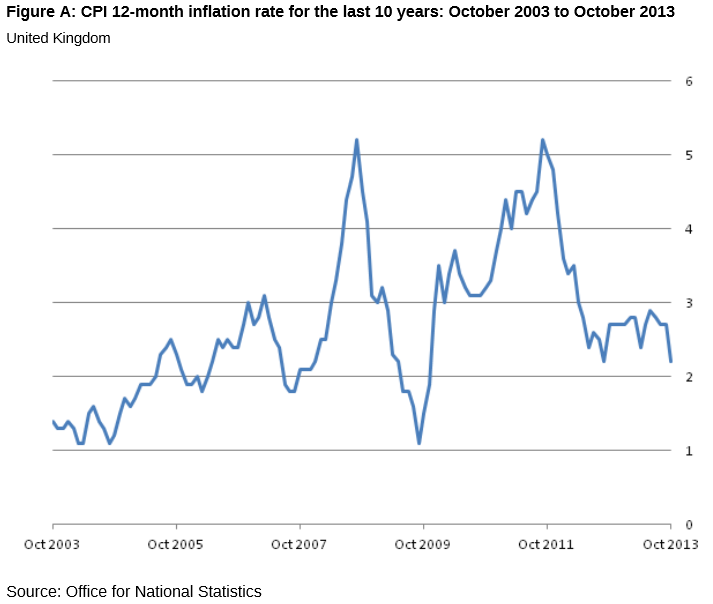 Unlike the press DON’T PANIC, the economic news is good but not that good in the Bank of England Inflation report. Reports of imminent Bank Base Rate rises next year are wildly exaggerated and unhelpful to the economy. We had one piece of good news on unemployment and the FTSE 100 took a tumble. 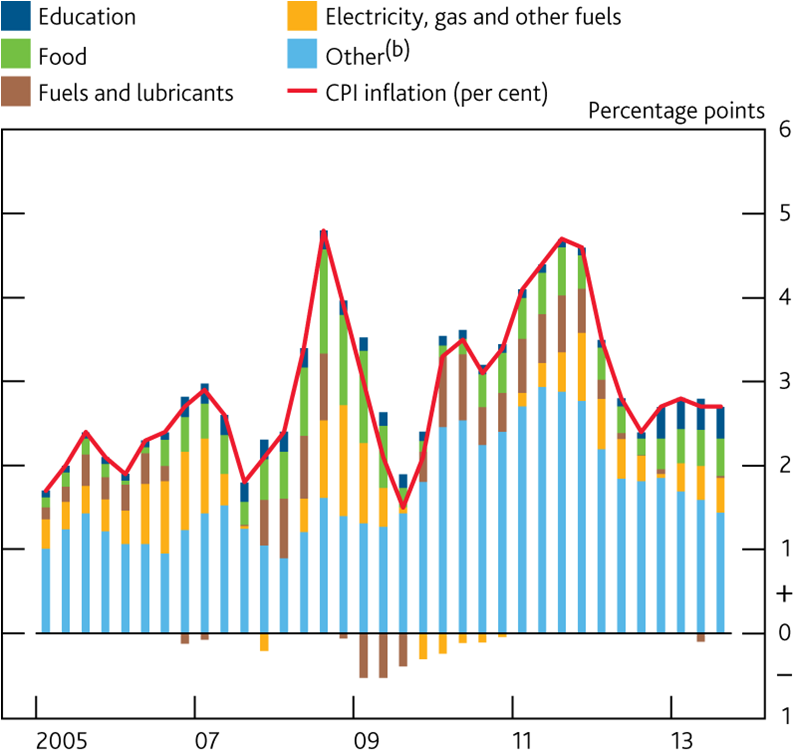 Let’s just start with the facts as CPI inflation is now down to 2.2% from 2.9% in June. 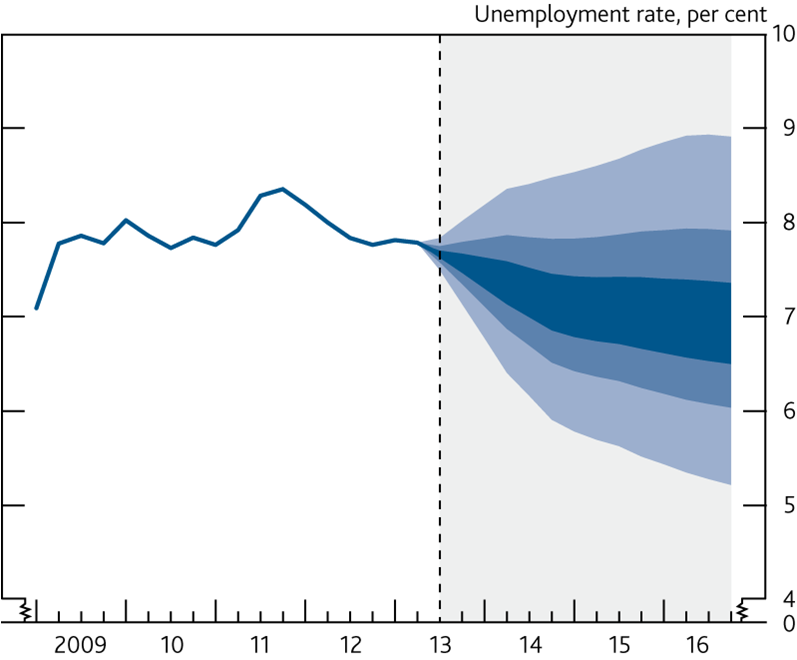 This means we are much closer to the medium term targeted inflation than we have been since December 2009. 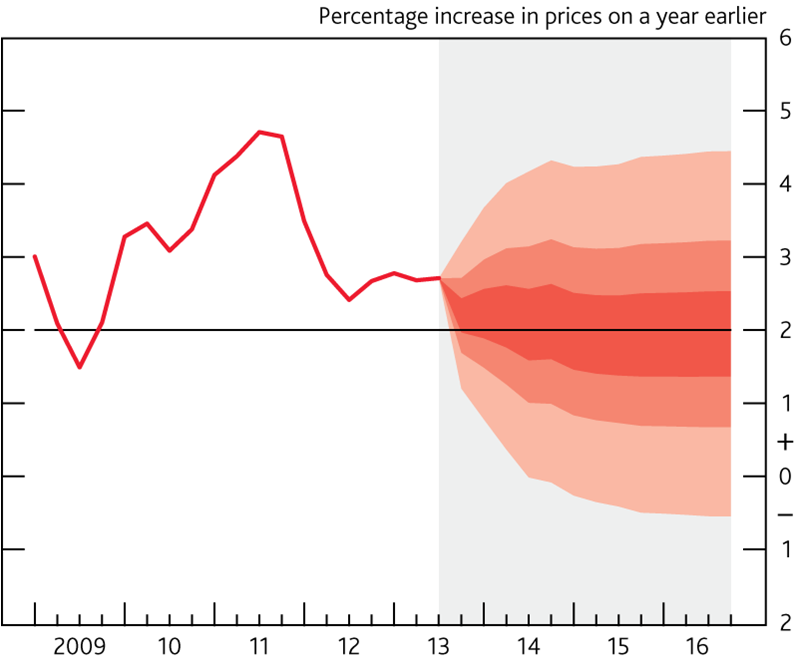 The disclaimer in my previous article about the ONS CPI inflation data was that it did not include the recent energy price increases. However, I have since found out that these increases are actually smaller than at the same time last year so should have no effect on year on year figures. Unfortunately it has been a consumption lead recovery in the UK rather than production as we are sucking in exports from Europe quicker than we are able to expand our export trade to places like China. 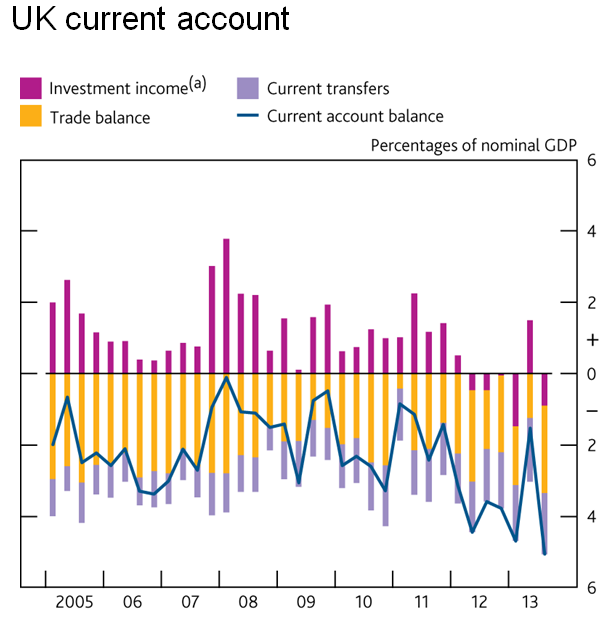 Hence we are running a trade deficit and not expecting a robust recovery like in the USA, because our increase in export trade has not been dynamic enough. 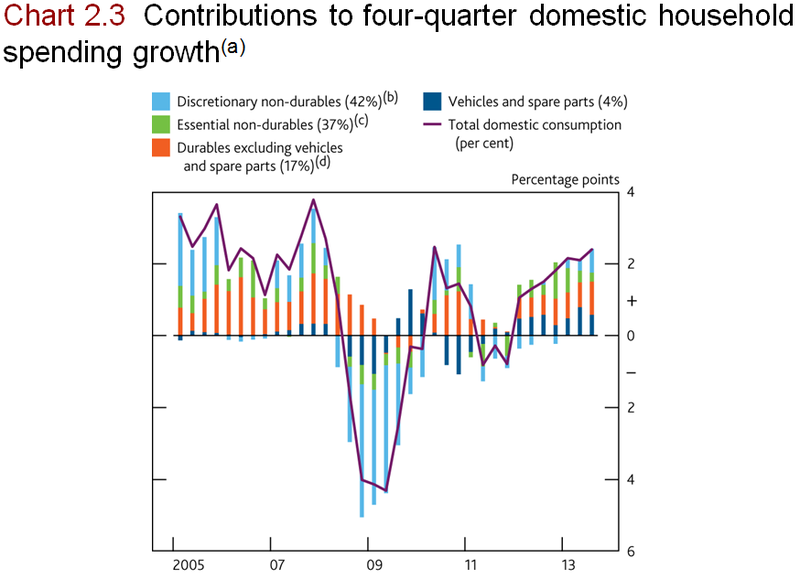 This can be seen in where the recovery is happening in house prices. London which is lead by the service industry and consumption has had house prices rising by 10% where the National average is 4.3%. The North where manufacturing industry has traditionally been based is seeing little or no increase in house prices dependent on the area. 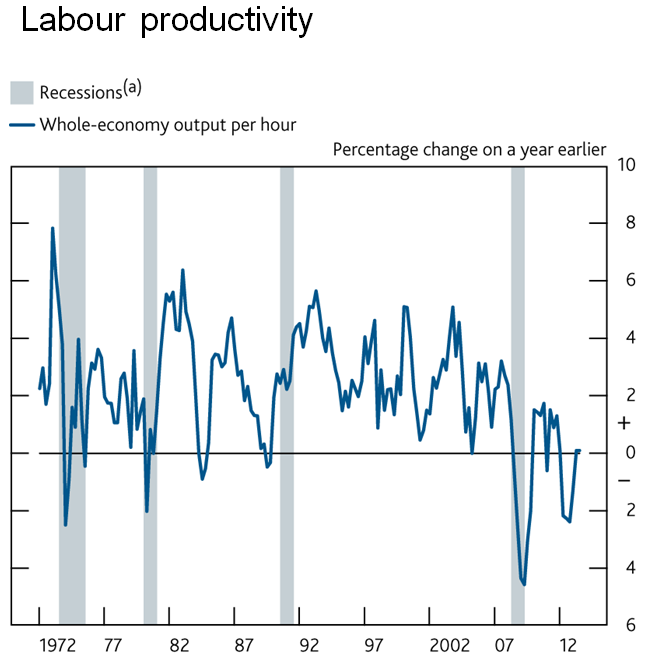 The productivity gap where we were seeing an increase in private employment, but a much lower level of increase in output has now started to close which is good news, but to really see a long term sustainable robust recovery it is business investment that needs to increase so we can compete with emerging low cost markets. 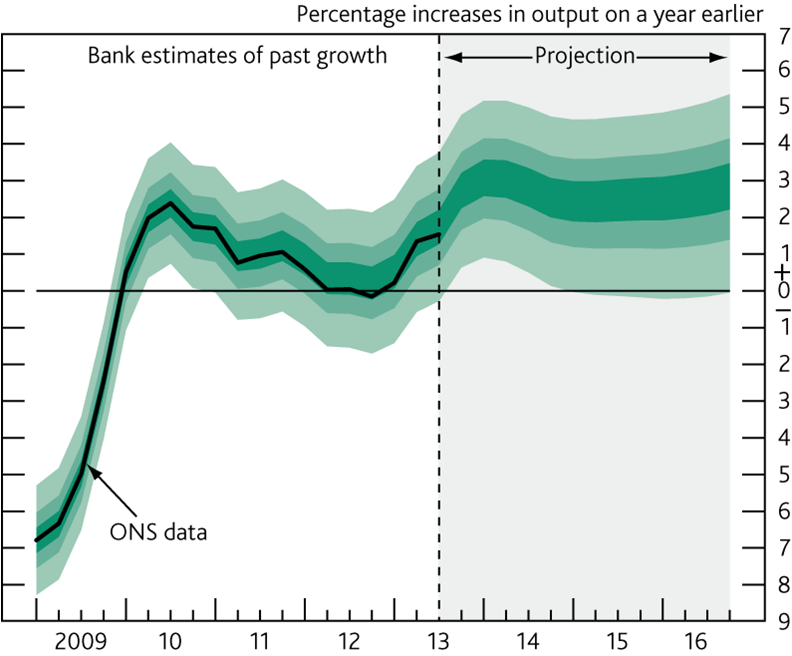 The GDP figures shown in the chart below are predicted to improve with growth at about 2 -2.5% per year, but this is within target for GDP without putting pressure on inflation levels or interest rates. 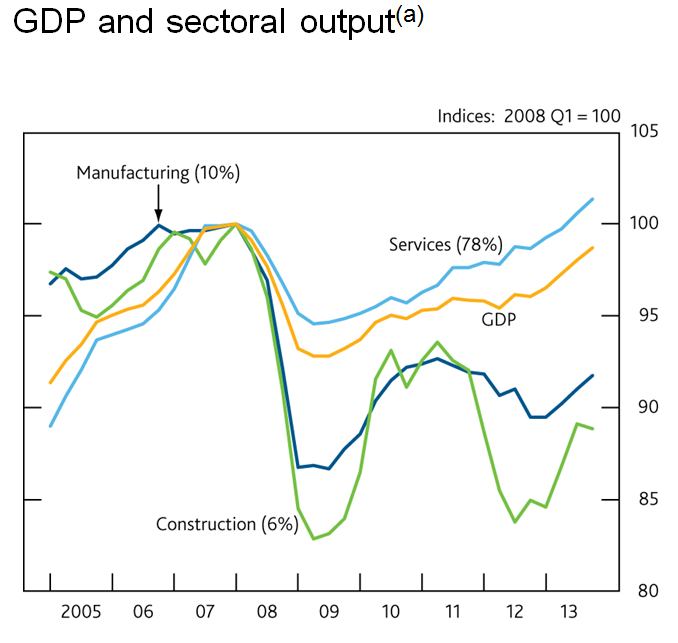 Overall the UK economy is in a much healthier position than it was a year ago, but stagnation in our main trading partners in Europe and lack of corporate investment and exports means we have little to worry about at the moment concerning an imminent boom and a need to increase interest rates before the end of 2015 or beyond on current projected figures. Unless you are a qualified contracts lawyer who has also studied Latin you will probably not have a clue as to how contra proferentem mortgage conditions affect you. I have spent the last two weeks getting my head around it as it was a key point in the barristers opinion for the Bank of Ireland Tracker Mortgage Class Action which has stalled due to all funds raised for that campaign having been exhausted. Therefore, for the benefit of everybody with a tracker mortgage who may be affected by a hike in their tracker mortgage margin at some point, and in particular to those affected by the decisions of West Bromwich Mortgage Company and the Bank of Ireland I offer this laymans interpretation and my thoughts on how we should progress. Very simply, the contra proferentum law is created to enable judges to decide which conditions apply if contractual conditions are in conflict. In other words, if the contract has two or more conditions and they don’t all say the same thing one of the conditions will apply and the others will not. The relevance of this is that West Bromwich and Bank of Ireland have conditions in their mortgage documentation and some conditions contradict others. Other legal arguments will only suit some of our Class Action Group. For example, there appears to be no legal definitions of a sophisticated landlord but West Bromwich think it is anybody with more than three properties. Let’s say we win that battle and the Court decides it’s six – anybody with seven or more isn’t going be too happy are they? I will be one of them! Also, what good would that do for those affected by Bank of Ireland or by any other lender who tries this on? Remember, Bank of Ireland has a different criteria and is not using the sophisticated borrower argument. Other lenders will no doubt make up their own excuses too. 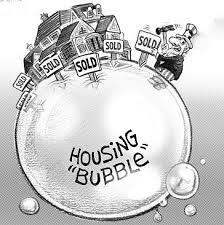 What we need is a win which will affect ALL mortgage lenders. 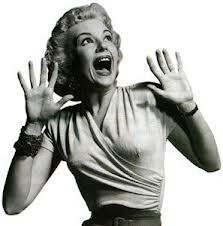 Many people are arguing that they didn’t receive the Mortgage Conditions from their lenders. Well sorry folks, maybe you did, maybe you didn’t, but I can assure you that you signed a piece of paper before your mortgage completed to say that you did. The Mortgage Deed I signed for my West Bromwich mortgage states “By signing this Mortgage you confirm the terms of the Standard Conditions of Offer, the Special Conditions and the Mortgage Conditions”. There are many more arguments which I could play devils advocate with which have been raised on our forums. With a bit of thought I reckon I could win most of the arguments and I’m not even a qualified solicitor. I am, however, in the same boat as you so please don’t shoot the messenger. I’m also affected by these increases and I’m doing everything I can to make sure we win this fight. In my case that’s been 18 hour working days for the last three weeks and a lot more time on the Bank of Ireland case since it reared its ugly head earlier this year. That’s why I would like Justin and the barrister to lead with what I believe is our best shot – contra proferentem mortgage conditions. If we ask our lawyers to look into every legal argument we have presented on our forums we will run out of money before we get to first base. What I would prefer is that we fight the one universal truth which is that our mortgage terms are contra proferentem. If we lose and we still have some money left there’s nothing to stop us appealing on other grounds as well. For the above reasons, do you agree that we should ask our legal advisers to focus on contra proferentem mortgage conditions? There are lots of other things we can do as a group to be a thorn in the side of these lenders in the meantime. For example, I love the PR campaigns and lobbying we are sharing ideas on. We must continue to win the hearts and minds of the media and every centre of influence we can think of. I also applaud the tactics being used to make these lenders lives a misery, for example the Subject Access Requests. Perhaps the most important thing we can do whilst we wait for the legal bods to advise us is to spread the word. We need to get every borrower we can find with a tracker mortgage to sign up. There are also plenty of other landlord groups who can help us to do this and it’s in all of our interests to put as much pressure on them as possible to get involved and spread the word amongst their members. I owned a substantial number of buy to let properties at the time of my mortgage application and still do. The chances of me proving that I was not a sophisticated landlord are very slim but I do have an argument to suggest that property investment was not my line of business at the time I took the mortgage. All of my properties were professionally managed in order to allow me to focus on my career as a commercial finance broker. I did not consider myself to be a professional investor at the time I took out this mortgage, the purpose of investing into a property portfolio was to provide for my retirement. I don’t want Justin or the barrister to push that angle though, I think it’s a waste of money as everybody’s situation will be very different. Neither my mortgage broker nor my solicitor were aware of the rights of West Bromwich Mortgage Company to increase the premium they charge on my tracker mortgage rate. I did read the Mortgage Conditions brochure at the time and at the time I sincerely believed that section 5 of the Mortgage Conditions was not applicable. Note that I am also a qualified mortgage adviser and IFA. 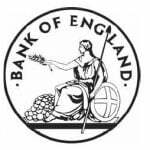 I believed that section 5 of the mortgage conditions booklet was only relevant to mortgages written on the building society’s standard variable rates, which do not track the Bank of England base rate. This was supported by the marketing materials being used by the West Bromwich to promote their tracker mortgages. Also, there was no mention of such a vital clause in either their KFI document or their offer letter. Clearly my solicitor was mislead too. I suspect everybody who was affected by the Bank of Ireland rate hike would also say the same thing. So having established that I read the booklet and I signed to agree to all of their terms, including those in their Mortgage Condition booklet, what makes me believe West Bromwich are still in the wrong? Logic tells me the above are in conflict with Section 5 of the Mortgage Conditions booklet which I signed and received. On the basis that West Bromwich produced the booklet, their website, and the Mortgage Deed I believe there is a clear case of conflicting conditions and ambiguity, hence the conditions they are relying upon are contra proferentem. On that basis, a judge MUST rule against West Bromwich as they are the originators of the documentation. It’s not like we are asking for the mortgages to be written off, all we want is the terms and conditions we believed we had signed up for. We MUST win a Court Case before even more lenders follow suit. For borrowers without family and/or business partners whose finances could be affected adversely by death during a mortgage term, the risk of having no Landlords Life Insurance is perhaps an acceptable one for them. However, for people who have borrowed jointly or would like to leave their properties to loved ones the risks are far higher. In the event of the death of a borrower, even if it’s a joint mortgage, it is usually well within the rights of a mortgage lender to call in their loans. This is more likely to happen post credit crunch as several lenders have closed their doors to buy to let lending and want to recover as much money as possible. Lenders which are still actively in the market can now lend money at far higher profit margins so there is every incentive for them to call in their loans in the event of death too. I am not a financial adviser and the following should not be construed as financial advice. It’s just my opinion as a landlord on what the minimum amount of Landlords Life Insurance should be purchased. I have concluded that the minimum amount of Landlords Life Insurance I should buy is the difference between my outstanding loans and the amount those loan balances would need to be to get 50% lending. As a simple example, if I were to own one property worth £100,000 with an £85,000 mortgage, I reckon I would need to purchase £35,000 of life insurance to enable my wife to be able to pay £35,000 off the mortgage and take a new mortgage for £50,000 (which is likely to have a higher interest rate) in order to maintain the status quo in cashflow terms. Now that’s very much a rough estimate as everybody’s circumstances are different but I hope you will find it a useful rule of thumb. The other reason I think the minimum amount of Landlords Life Insurance should be enough to reduce loans to 50% LTV is because at that level of lending, most mortgage lenders would be falling over themselves to offer decent interest rates, pretty much regardless of any market conditions I can realistically imagine. As you have probably heard, Bank of Ireland (BOI) and Bristol and West have advised borrowers who took tracker rate mortgages with them prior to 31st October 2004 that they are increasing their margin to 4.49% over bank base rate. 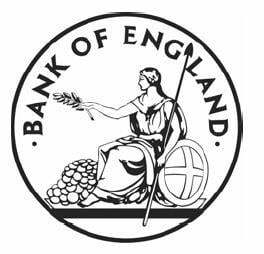 Paul Tucker the deputy Bank of England governor has told the Treasury Committee that negative interest rates should be considered. I received a phone call a month or so ago to saying that my tenants have flooded my property and wanted me to pay to get the damage fixed. I suspect your response would have been the same as mine. Obviously I asked what had happened and they said they didn’t know. Apparently my tenants had been away and left relatives in the property when the problem occurred. I asked if anything was leaking and it wasn’t, nothing was blocked either. The scale of the damage was quite bad, the problem was a flood in the bathroom which had effected downstairs walls and ceilings. I didn’t need Sherlock Holmes or Miss Marple to solve this mystery, their guests had obviously let the bath overflow. The Principality Building Society will consider lending on holiday homes using their standard buy to let product range and criteria.